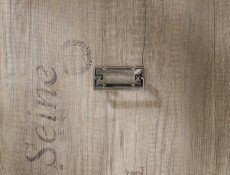 Size: 80 cm (W); 197 cm (H); 54.5 cm (D). 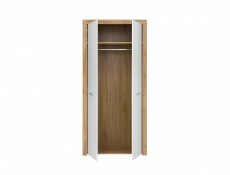 NEPO furniture range offers a 2 door wardrobe with full width hanging rail and shelving insert above.This neutral, multifunctional range is suitable for use around most household rooms including small office, bedroom, living room and in a children bedrooms. 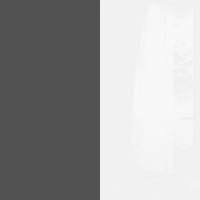 The set can be matched to any colour décor making the children's set equally suitable for both younger and older boys and girls alike. 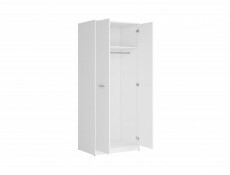 The modular design can be added to for larger rooms but the lighter colours available also make it perfect for smaller rooms. 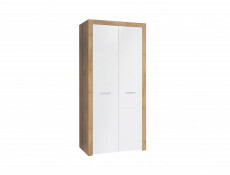 Made with highly durable laminate, this furniture can be wiped clean with a damp cloth, ensuring it is easily maintained. 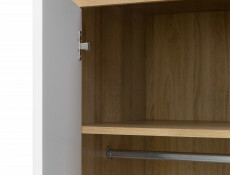 Linear handles keep the look stylishly simple, and small button feet with a plinth along the front reduces the ability for small items to roll underneath. 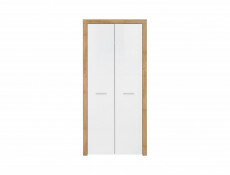 Modern double wardrobe in sought after White Gloss and light Oak finish from Balder furniture range. 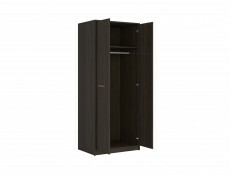 Wardrobe has two full length doors with hanging rail and spacious shelf inside. 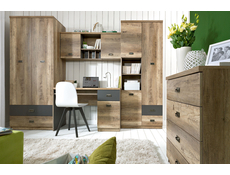 The Balder bedroom furniture collection is perfect for a simple and modern bedroom, hallway or office / study. 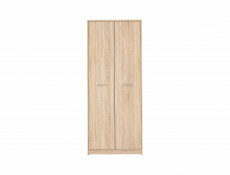 Wardrobe comes in Riviera Oak wood effect finish with White Gloss fronts. 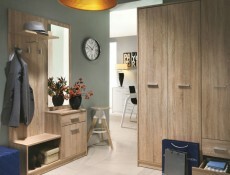 Malcolm furniture range offers a Two Door Wardrobe with two drawers. 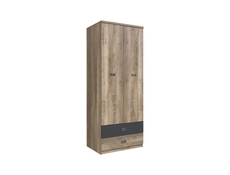 Malcolm furniture collection offers various functional furniture pieces, perfectly suited to both large, as well as tight and small interiors. 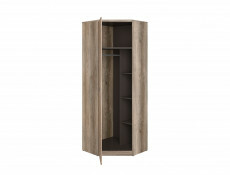 Modules can be used to create a youth room or an office.Malcom furniture collection is finished in a durable laminate with body of the units in Oak Canyon Monument finish and fronts in the same finish with letter print effect on them and Grey Wolfram (matt grey) inserts.Character of Malcolm furniture is accented by modern sketch type print letters and large, easy to use, handles in antique nickel coloured finish.Practical drawer guides have brake mechanism that keeps drawers in place and ensures that even when rapidly pulled out, its contents do not spill onto the floor. 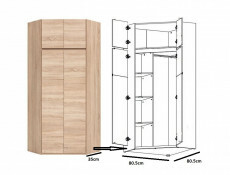 Size: 205,5 cm (H); 80 cm (W); 57 cm (D). 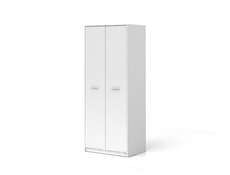 Academica furniture range offers a two door two drawer wardrobe - Size: 198,5 cm (H); 80 cm (W); 56 cm (D). 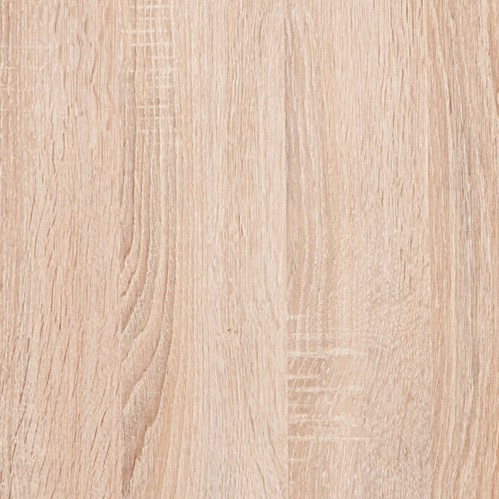 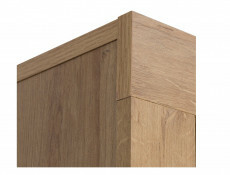 Handle less design will aloow this furniture to be easily combined with any other range in Sonoma Oak finish. 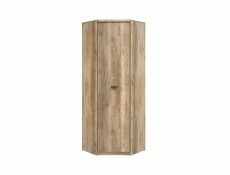 Size: 90 cm (W); 200.5 cm (H); 40.5 cm (D). 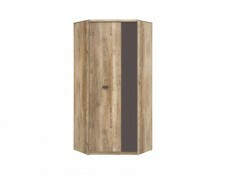 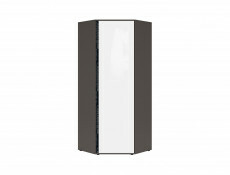 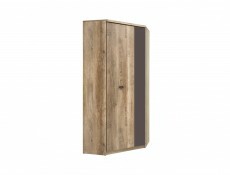 KASPIAN furniture range offers a tall 2 door cabinet with 2 drawers underneath. 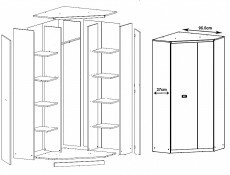 3 shelving inserts inside provide 4 storage comparments. 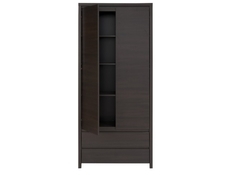 Available in Wenge.Furniture comes flat packed and ready for home assembly.User-friendly instructions and fixings included. 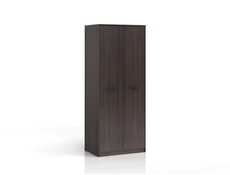 Academica furniture range offers Corner Wardrobe - Size: 198,5 cm (H); 80,5 cm (W); 80,5 cm (D). 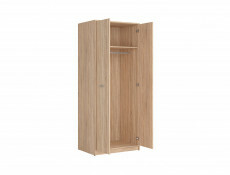 A corner wardrobe with hanging rail and 3 shelves inside. 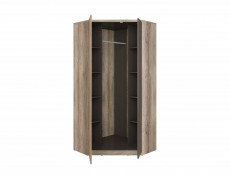 Also has an additional shelf at the top for storage. 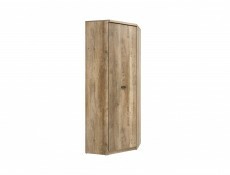 Spacious Single Corner Wardrobe in Oak wood effect rustic finish from Malcolm furniture range. 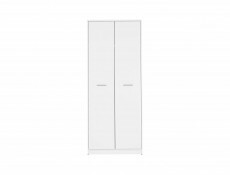 This L Shaped single door corner wardrobe offer amazing storage capacity and utilizes corner of the room to it's maximum potential. 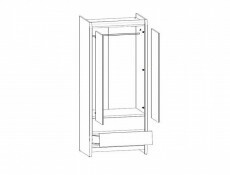 Internal layout of this single corner wardrobe consists of top shelf and full length hanging rail as well as pigeon hole side shelving. 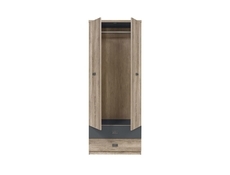 Door can be mounted either left or right hand opening. 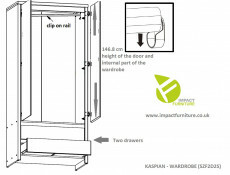 Wardrobe requires 74.5cm space each way from the corner of the wall. 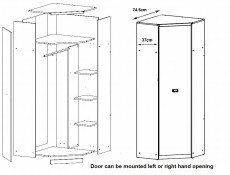 The side panels are 37cm deep and other furniture pieces of the same depth from Malcolm range can be placed next to the corner wardrobe. 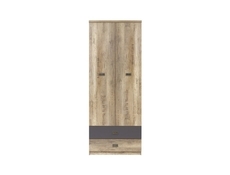 Malcom collection is finished in a durable laminate with body of the units in Oak Canyon Monument finish and fronts in the same finish with letter print effect on them and Grey Wolfram (matt grey) inserts. 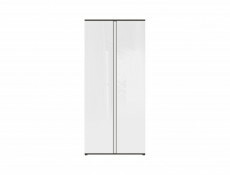 Tall double wardrobe in White Gloss or White matt finish from Kaspian range. 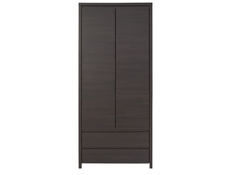 Kaspian 2 door wardrobe with 2 drawers underneath. 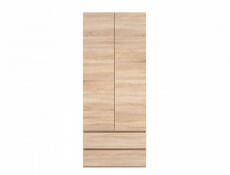 Moulded groove handles gives the impression of a handle-less smooth facade.Quality, German Hettich hinges add to the superior finish.Size: 90 cm (W); 200.5 cm (H); 55.5 cm (D). 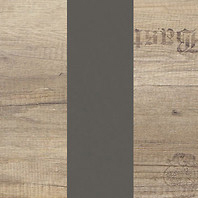 Size: 85.5 cm (W); 191.5 cm (H); 58.5 cm (D). 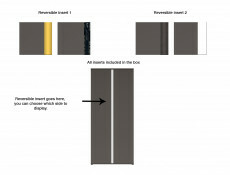 GRAPHIC furniture range offers a 2 door wardrobe. 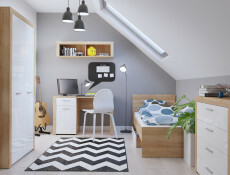 4 shelving inserts on left hand side.Hanging rail with shelf above on right hand side.GRAPHIC is a contemporary, versatile, modular range and its bold and contrasting block colours of grey, white and yellow make it perfect for any teenage bedroom. The optional decorative sticker accessories allow the owner to stamp their own individuality on their room.Yellow inserts with moulded groove handles gives the impression of a handleless smooth facade.Small, low profile feet add to this cubic furniture design. 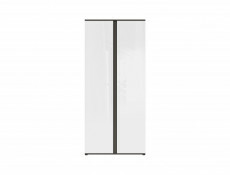 Grey Wolfram/ White/ Red; Grey Wolfram with White gloss; Grey Wolfram with Mirror gloss or simply Grey Wolfram. 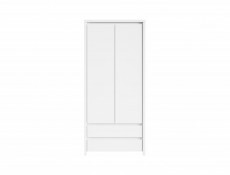 Modern, spacious White Gloss 2-door wardrobe with two drawers and a rail inside. 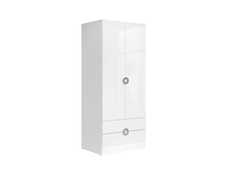 Ringo double wardrobe offers slimline storage solution for any bedroom. Modern design and simple form from Ringo furniture range manufactured by Black Red White. 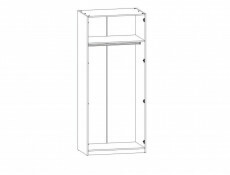 Size: 78 cm (W); 191,. cm (H); 78.5 cm (D). 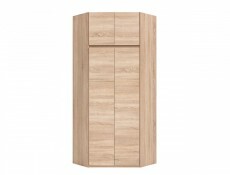 GRAPHIC furniture range offers a corner wardrobe. 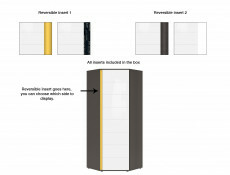 Hanging rail to the right and 3 equally spaced shelving inserts to the left with an extra storage shelf across the top.Yellow insert down the left hand side.GRAPHIC is a contemporary, versatile, modular range and its bold and contrasting block colours of grey, white and yellow make it perfect for any teenage bedroom. The optional decorative sticker accessories allow the owner to stamp their own individuality on their room.Yellow inserts with moulded groove handles gives the impression of a handleless smooth facade.Small, low profile feet add to this cubic furniture design. 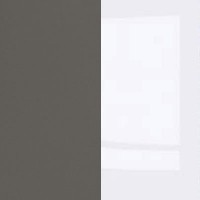 Available in 5 colour options; Grey Wolfram/ White/ Red; Grey Wolfram with White gloss; Grey Wolfram with Mirror gloss; Grey Wolfram with Beige; or simply Grey Wolfram. 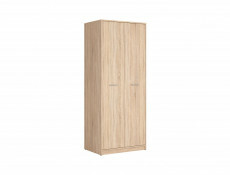 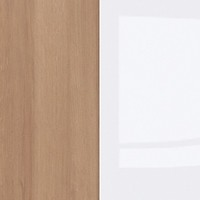 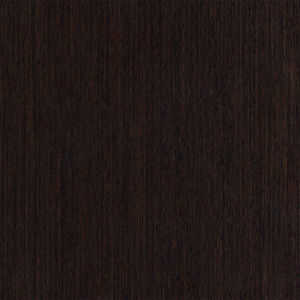 Malcolm furniture range offers a spacious, wide Corner Wardrobe in wood effect finish. 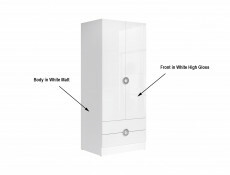 Wardrobe requires 95.5cm space each way from the corner of the wall. The side panels are 37cm deep and other furniture pieces of the same depth from Malcolm range can be placed next to the corner wardrobe.